Back in High School, when The Leopard was but a cub, I often found myself obsessing. I have a collector’s heart, and whenever I’d obsess, I’d collect. It was simply a way of trying to grasp my need. Like practically every other American male at the time, I had a huge crush on that vision of all that was right in the world, the utterly exquisite Farrah Fawcett–Majors (yes, that’s how I knew her at the time; she was married to The Six Million Dollar Man himself, Lee Majors). With those huge, impossibly white teeth - - those bright, ice-blue eyes, and that famous swept back hair—I couldn’t imagine anyone more beautiful. I wasn’t a fan of her television show, Charlie’s Angels. I was too impatient for its campy tedium. Actually, the first time I laid eyes on her was in the silly science fiction film, Logan’s Run. After that, I started collecting every magazine article, cheap paperback bio, and newspaper clipping I could find– no matter how obscure. Finally, I remember spotting one day at my local mall that iconic Farrah poster everyone knows. The revelatory and iconic image – featuring the youthful starlet leaning back in a blood red bathing suit, her head at an odd angle, displaying those glittering pearly whites, --and most importantly, the imprint of her perky young breasts, drove me completely insane – but at the time I was too young to understand exactly why. In no time I also bought a neatly ironed on T-shirt at a local Spencer Gifts that I wore proudly. Over time, I matured and my obsession subsided. My view of beauty expanded well beyond skinny, sun-baked blondes, but she’ll forever be my first bonafide celebrity crush. Some time ago on a long work weekend The leopard stayed at a beautiful resort in the midwest. It was the kind where almost every creature comfort you could imagine was attended to: masseuses, olympic size pools, and fully stocked bars. the only issue seemed to be that if you wanted to dine outdoors you had to battle dive-bombing birds, capable of whipping food bits directly off your plate, or your fork. The resort's managers came up with a elegant solution to the problem: Falcons. Looks like the majestic creatures are used to deter food-stealing birds from approaching your meal. This tall, impressive bird didn't even have to actually launch an attack at the smaller animals, just its hulking presence scares the bejesus out of smaller and less predatory species at sight. 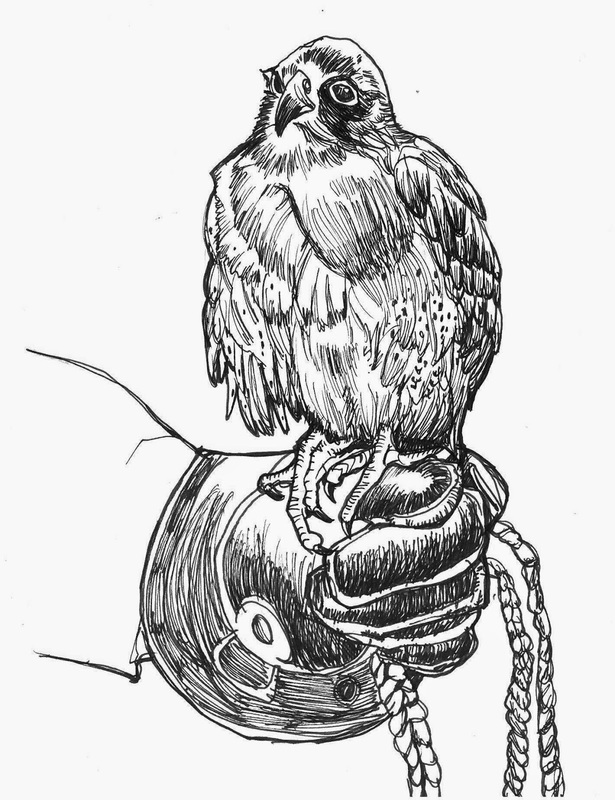 The falconer, whom I'll call "Hank The Handler" explained all this to me. As nice as my stay at the resort was, I spent more time hanging out with Hank and his beautiful, strange bird more than warming up a stool at the hotel saloon. Some years ago in The Leopard's past, I worked for a certain well known non profit jazz organization in New York helmed by world famous jazz trumpeter Wynton Marsalis. The job eventually became life forming and one the greatest experiences of my life, but I will never forget that fateful first week. In my capacity as Art Director for the organization, I was assigned to design a huge banner to herald the venue's upcoming season. Mr. Marsalis had mentioned to me he had just had a brand new Monette trumpet made, and I got the idea to use a photograph of the horn as the main art. 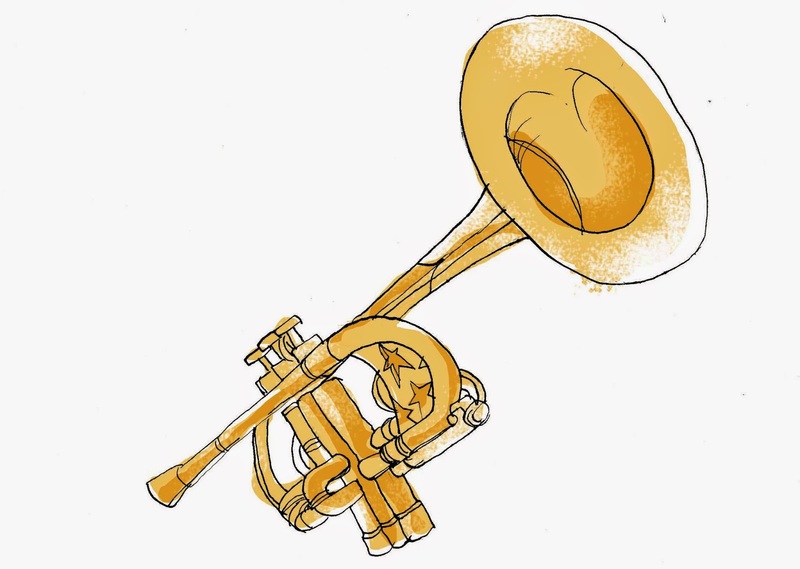 This particular instrument was completely designed and created with Mr. Marsalis in mind and was worth at least $10,000. Over a year had been spent on custom design details and development. I asked Wynton to borrow this gorgeous horn to take it to be photographed. He loved the idea (Wynton at the time didn't much like to be photographed himself, which would surely have been the next option) and cheerfully handed it over. I grabbed a subway downtown to a location that I wasn't entirely familiar with. Preoccupied with the task at hand, I suddenly realized I had arrived at my stop. Without thinking, I jumped off the train with a shot. But once the train doors started to close, I had a sickly feeling I had forgotten something. The case holding Wynton's golden horn was still on the seat! I grabbed for the doors and tried to pry them open with all my strength. A good Samaritan - a young woman who had been sitting next to me - picked up the case and tried to hand it to me through the closing doors. I felt utter horror as the train began to move forward. I yelled ,"Stop! Stop!" at the top of my lungs as the train started to speed up, leaving the station. Finally, the door opened again about two-thirds wide and with the woman's help, I was able to pull it towards me without a scratch on the case. As the train disappeared back into the tunnel, I'll never forget the satisfied look on the woman's face. I hope I get to meet her again some day and buy her a beer. Before there was Harrison Ford, before Mel Gibson and Arnold Schwarzenegger, even before Sean Connery, there was Bogie, the greatest of them all. the prototype, the true star. 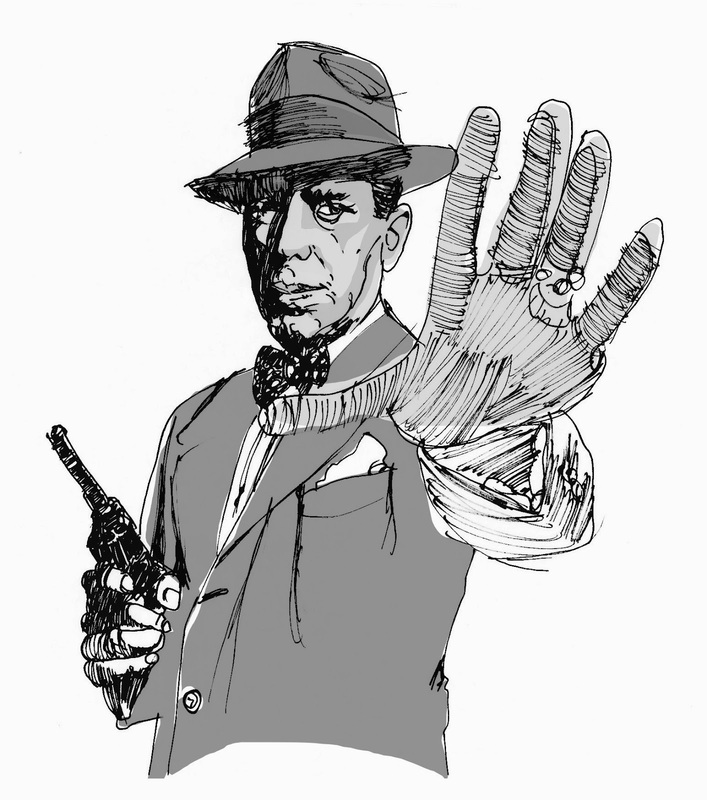 No one was better than Humphrey Bogart at balancing sheer masculinity with stirring sensitivity. The Leopard's favorite Bogie performances - Dixon Steele in A Lonely Place, Sam Spade in The Maltese Falcon, Fred C. Hobbs in The Treasure of the Sierra Madre -- all featured tough, weathered men who always had a certain vulnerability. Bogart's best known role - Rick Blaine in Casablanca -- showed this unique talent most eloquently. He was a man's man and a woman's man at the same time. Something that very few actors have been able to achieve -- and he did this without conventional movie star good looks. He didn't look like Montgomery Clift, Gregory Peck or Cary Grant. He didn't have to. His beautiful, sad, face was all he needed. There's always been something special about Chrissie Hynde. Born and raised in Akron, Ohio, Hynde was one of those outside kids straight out of am SE Hinton novel. A rock n' roll obsessive, She moved to the UK in hopes of writing for the British pop zine, New Music Express (NME), waxing philosophical about current rock music. After much ambling around, a she formed the band The Pretenders, a force that as much as any defined late 70's early 80's rock. Hynde's distinctive kittenish voice could scream and wail as well as say, the Clash, but she could croon as beautifully as Linda Ronstadt or Karen Carpenter on their best days. Her version of Nick Lowe's "Stop You Sobbing" perked up ears in 1978, but her own composition - the one that she and the band are probably best known for - "Brass in Pocket" became her signature. The story of a poor, besotted waitress trying to get the attention of a witless greaser, the song heralded a female rock sound like no other. Self titled, the whole first Pretenders album was full of gems and there was no turning back. By this time Chrissie is a living legend, with an emphasis on the living. Click here for a video of her new song Dark Sunglasses off her new album, "Stockholm".